Wilson & Wilson Estate Planning & Elder Law LLC assists clients in drafting and preparing wills, trusts, living wills and powers of attorney for health care and property. For maximum estate tax reduction, we use a variety of planning techniques, including bypass trusts, charitable trusts, irrevocable life insurance trusts, grantor retained trusts, qualified personal residence trusts and family foundation. Asset protection planning is implemented for our clients by using limited partnerships, limited liability entities and other devices. 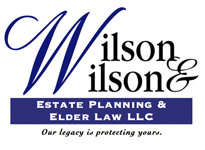 Wilson & Wilson Estate Planning & Elder Law LLC offers consultation and planning concerning issues confronting the aging person. Our planning allows an elderly family member to enter a nursing home while preserving the family assets. Wilson & Wilson Estate Planning & Elder Law LLC is often called upon to assist clients that have disabled children through the use of supplemental needs trusts, guardianships and other planning tools to protect the disabled person and keep his/her governmental assistance in force. Wilson & Wilson Estate Planning & Elder Law LLC offers a comprehensive array of services, from pre-administrative consultation through final accounting and closing of the estate. We offer post mortem tax planning, estate, fiduciary and inheritance tax return preparation. Wilson & Wilson Estate Planning & Elder Law LLC is often called upon to act as Executor or Trustee for the process of administering a decedent's estate. Today's businesses are often confronted with issues such as appropriate choice of entity, employment matters, state and federal filings, and real estate considerations. Wilson & Wilson Estate Planning & Elder Law LLC assists business from implementing the founder's vision of the business to the orderly succession of ownership. If someone close to you is unable to care for him or herself or oversee matters relating to their property, our probate lawyers can help you establish a guardianship to insure your loved one is cared for and his or her property is looked after in a competent and professional manner.